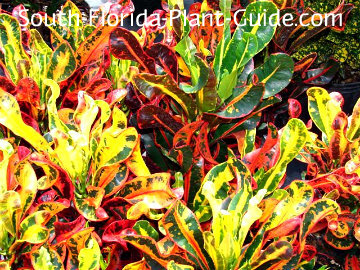 Crotons are the most popular of South Florida's colorful foliage plants, with brilliantly-colored leaves shot with gold, red, orange, green and even pink. This easy-care shrub features color and low-maintenance for any size yard. They feature many leaf types and sizes - swirly, narrow ribbons to wide, flat leaves. Some have fun names like Dreadlocks and Sloppy Painter. Others are more dignified such as Eleanor Roosevelt and Ronald Reagan. We've included all varieties in the Small Shrubs section because most can be kept at 3 feet...though you can let them grow larger if you prefer. Some cultivars including Gold Dust, Corkscrew, Sloppy Painter, Red Bravo and Stoplight, can get as big as 10 feet tall...these varieties are best kept about 4 to 5 feet. 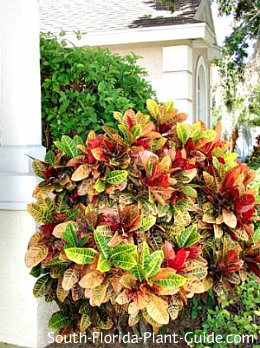 One of the smallest croton plants is Mammy - a red variety with bright red, yellow and green leaves (pictured above), or a yellow Mammy with yellow foliage and a bit of green. The Mammy croton can be maintained about 2 to 2-1/2 feet. Different varieties can be planted together for a riot of color and a mix of textures, or place several of the same variety to grow together in a "drift." These gorgeous shrubs can jazz up an all-green landscape or work well with flowering shrubs or other plants prized for their bright foliage like the Ti plant (cordyline 'Red Sister'). A benefit of mixing crotons with flowering shrubs is the consistency of color in the landscape, even while other plants are not in bloom. ...like Mrs. Iceton, Magnificent or Red Corkscrew. If an all-yellow color works better with your landscaping, there are plenty of these available - including General Padgett, Galaxy and Narrow-leaf Gold Dust. These are slow growers, and most can easily be kept 3 feet (or less for smaller varieties). You can plant in almost any light - full sun to partial shade - with some types of this plant, like the classic Petra, preferring a bit more shade. 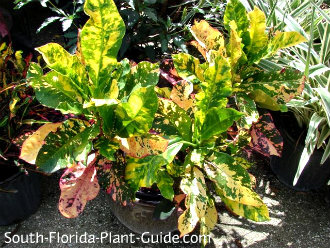 Many (such as Mammy croton) attain their brightest coloring in full sun. Moderately salt-tolerant, these shrubs do best in Zone 10. In Zone 9B a croton can be grown in a container and moved inside during winter. These plants contain toxins, and are considered to be resistant to damage from deer (though we make no guarantees). Add a combination of top soil or organic peat humus and composted cow manure to the hole when you plant. 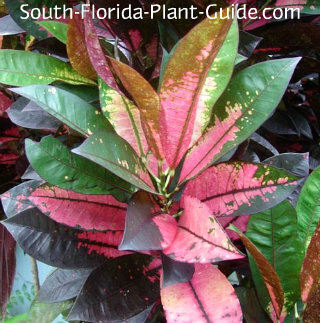 When shopping for a croton or another foliage plant, always look at lower leaves. These will generally indicate what the overall color and look of the plant will be when it's more mature. Make sure the area is well-drained...crotons will not put up with "wet feet." This shrub is moderately drought-tolerant once established, though it does best with regular irrigation schedule that gives it time to dry out between waterings. Trimming is only needed occasionally to keep the plant's size in check. 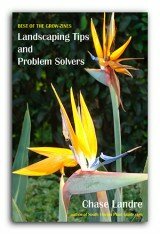 As with all foliage shrubs, always trim stems - don't cut across leaves. Fertilize 3 times a year - once each in spring, summer and autumn with a quality granular fertilizer. Smaller croton varieties can go as close as 2 feet apart. The rest should be placed 2-1/2 to 3 feet apart. Come away from the house 2 feet or more. These make excellent container plants, especially nice (and non-messy) in a poolcage. 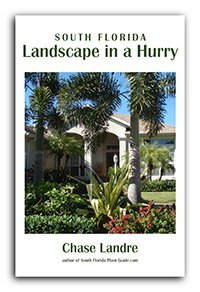 COMPANION PLANT SUGGESTIONS: Podocarpus, loropetalum Plum or loropetalum Burgundy, dwarf allamanda, dwarf ixora, thryallis, hibiscus, ruella, and viburnum. My NEWEST EBOOKS are here!